Having spent the last 6 months working with the Wildplay team as part of my role on the board at Mount Sima (Whitehorse), I was anxious to check out another of the Wildplay facilities to see how they operated and what we could learn to bring back to the Yukon. 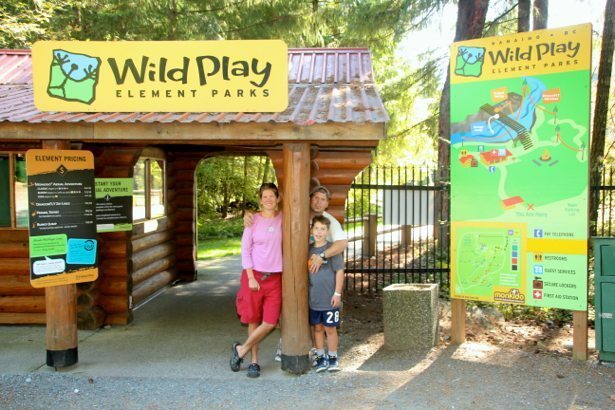 Wow… the Nanaimo Wildplay location is amazing. Tucked away off the main highway it is a lush, forested play park that is intimate yet like an adventure waiting to happen. The sun was beaming down when we got there at 10:30 and it had the makings for a great day. 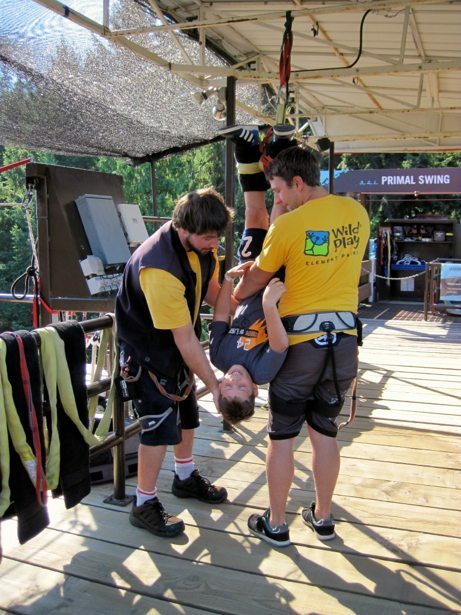 Thanks to the generosity of the Wildplay corporate team, we were able to partake in all of the park’s offerings and are happy to fully recommend every single one… Primal Swing, Bungie Jump, Dragonfly Zipline and Monkido Aerial Adventure. I’m not a big fan of free fall – don’t really like roller coasters etc., so Bungie Jumping was left solely to Tim but I did agree to do the Primal Swing with him in tandem. It turns out that I MISTAKENLY thought it was just a big swing off the bridge… should have watched the video’s a little closer! Remember my opening statement??? After getting into our harnesses, we are seated in 2 plastic seats at the edge of the bridge. I first start to sense a bit of trepidation when our harnesses are attached to what looks like a big slingshot and the guide is working hard to offset the pressure that is being pulled on us. The butterflies in my stomach started to really dance when the guide started to let go of the harnesses and we could feel the pressure. Then it was 1-2-3 “GO” and OMG!!! 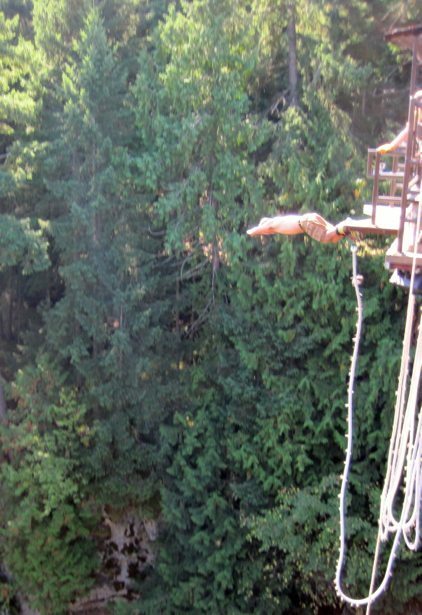 I was free falling and screaming my head off. The only thing that made it manageable was having Tim sitting right next to me – and he was grinning from ear to ear and laughing his head off so it couldn’t be that bad right? We fell down towards the water and then swung in a big arc back up into the air opposite of the bridge. At that point my immediate thought was “what goes up must come down” – OMG!!! and back came the free fall again… thankfully the swing arc decreased after that and it was a fun swing with no free fall components. Hunter had his way with the guides up top on the bridge and we got lightly dunked but not soaked so all was good. After getting picked up by the boat on the river, we headed back up the stairs for Tim to do his bungie jump. As we were in the swing, he said “I’m not sure I’m up to the Bungie…”. I was very supportive of the fact that he didn’t have to do it, but that I was NOT doing the swing again with him. I actually renamed it the Primal SCREAM for anyone I spoke with that entire day. With Hunter pushing him on, Tim boldly stepped in to the Bungie platform and actually dove headfirst off the bridge towards the river. With a scream and then a massive laugh, he bounced up and down and had a great time. After a short wait we were off to the Dragonfly Zipline. It is a 2 line zip line that runs over and back across the River. 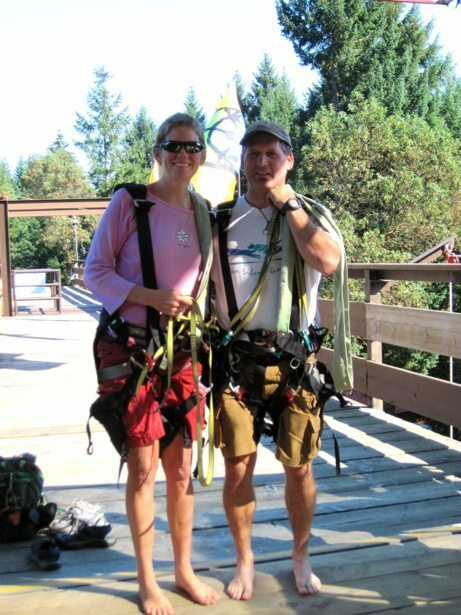 It is a great introduction to ziplines for those that haven’t done it before or might be feeling a bit of trepidation. 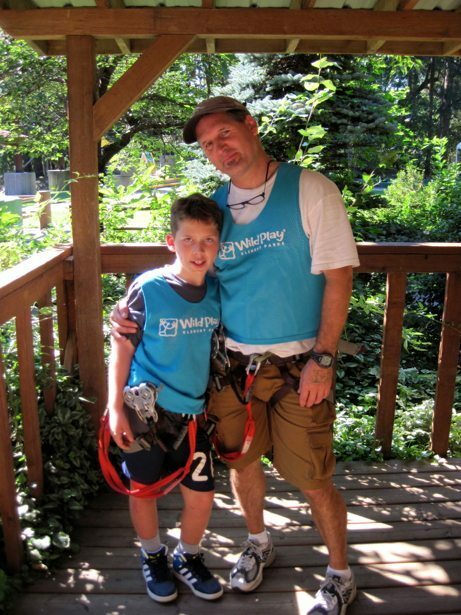 We had experienced the Zoom Ziplines at the Wildplay Yukon facility last year, which are over 1km in length, so were excited to have some more fun. As Hunter is under 100 lbs he had to go tandem with one of the guides. Brian the guide did an amazing job of being his buddy. They would take a running start off the platforms to see how fast they could get going… it sure makes it seem cooler to have a buddy than to go alone! By the time we were done our zipping it was perfect timing for a lunch break. Lucky for us our camper was just out in the parking lot so we headed out for a lunch break and some hanging out. We spent the afternoon in the Monkido Aerial Adventure course. Hunter is JUST (by the tips of his toes) tall enough to do the buddy course so he and Tim were buddies. What this means is that the kids get to do the kids course once and then get to do 2-3 legs of the full course but not the final “black” leg, which is the hardest. Their “buddy” is on the course with them to ensure that they are being safe and have help when required. Hunter is an old hand at Monkido courses, having spent a bunch of time on the Yukon one. He zipped right through the kids course and was ready to move right into the full course. Being “just tall enough” does create some challenges on the course as it means that the tether between your harness and the safety line can be very snug at times. We came up with some creative approaches to work through this and he had a fun time. 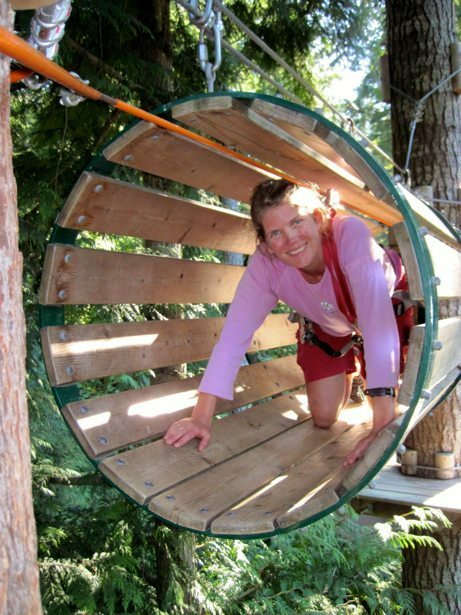 The course itself is fabulous – it winds through the trees and many times you can’t see what the next obstacle is due to the lushness of the forest. The obstacles push some peoples comfort zones and yet are 100% safe and secure. I view them as a big kids jungle gym and would be happy to do this every day! We definitely recommend this (and any of the Wildplay facilities) to families that are looking for some outdoor, active fun together!